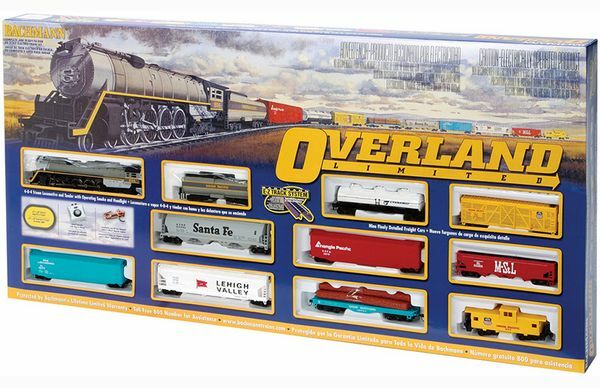 Bachmann 00614 Overland Limited HO Scale Electric Train Set from Bachmann. This Set Features a Steam Locomotive and Tender with Nine Detailed Cars. Includes the E-Z track system. This is the BA00614 Overland Limited HO Scale Electric Train Set from Bachmann. This Set Features a Steam Locomotive and Tender with Nine Detailed Cars. Includes the E-Z track system. Create a 65" X 38" oval track: twelve 18" radius curved, one 9" straight terminal rerailer, five 9" straight. Union Pacific Overland 4-8-4 steam locomotive and tender with operating smoke and headlight Prepainted gray, black, and silver with yellow print. 51' Grain Car--Santa Fe (gray with black print). 42' 3-Dome Tank Car--Cyanamid (white with blue print). Flatcar with Logs--Great Northern (turquoise with white print). Center Flow Hopper--M St.L (maroon with white print). 42' Open Quad Offset Hopper--Shell (yellow with white, red and black print). 41' Wood Stock Car--Union Pacific (yellow and red w/white and blue print). 36' Wide Vision Caboose--Union Pacific (yellow and red). Assembles in just minutes with no nails, screws, or special tools required. Por favor, continúe revise de nuevo, precios y disponibilidad están sujetas a cambios. Información adicional se modificará cuando esté disponible. Pedimos disculpas por las molestias. ¡Gracias!